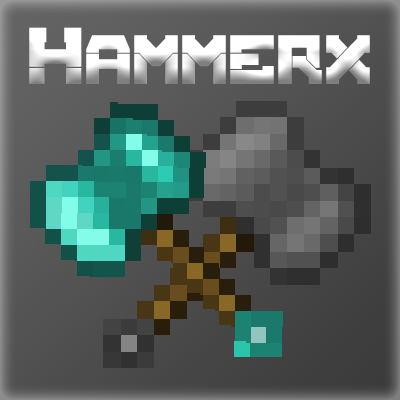 This Mod adds Dynamic Hammers of multitude and has a lot of Mod Compat. Yes you can use Tinker's I completely realize this but this mod just is for those pack's not using Tinkers! Due Note as of Now its a functioning Port of Hammerz but I am rewriting the mod from the ground up. For Now Enjoy the Port! It doesn't seem to work with Thaumcraft. None of the Thaumcraft hammers show up in the creative inventory or JEI; Immersive Engineering metal hammers are there, though. I'm using Thaumcraft 6.1.BETA26 and Hammerx 1.1.3. Would it be possible to add Base Metals support later on? How much of the original HammerZ is implemented/planned? Right now its a port...it will be its own mod with a lot of cool features...but its just a port now!! Awesome, HammerZ was my favorite hammer mod out of the ones I had played with. I look forward to playing with this port. Update Guys Roots Classic and Ex Nihilo: Creatio supported! This will be my last update unless something breaks...I gotta work on the re-write! Astral sorcery? PSI (With spellcasting? ), Magical PSI? It was more of a suggestion for the future if they weren't already planned.